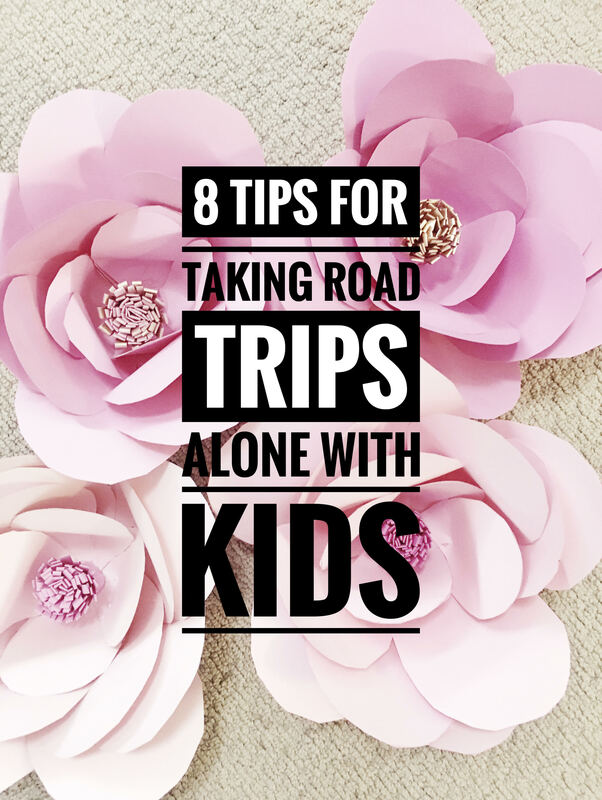 I’ve put together 8 tips for road trips with kids alone. I know what you’re thinking, why on earth would a parent ever want to take a long drive alone with kids? Sounds like torture. I thought the same thing until I did enough times to put together a system that works well for everyone. When our 3 kids were 4 years old and 22 months (twin boys!) my husband got a new job in the SF Bay area. We had to relocate our family from Southern California to Northern California, which was about an 8 hour drive. Prior to the move, we had promised my daughter a huge 5th birthday party. All of our friends and family at the time was in So Cal so we decided to have the party down South. The party was planned on a Saturday, which was 6 weeks after my husband just started his new job. My husband wasn’t able to fly down for the party until Friday night. Being a Pinterest-aholic I made most of my Hello Kitty party favors prior to the party. However, I needed to go down a couple days prior to the party to bake cupcakes and buy the food for the party. Taking myself and 3 kids on a plane was financially not a good option (even though its an hour flight!). 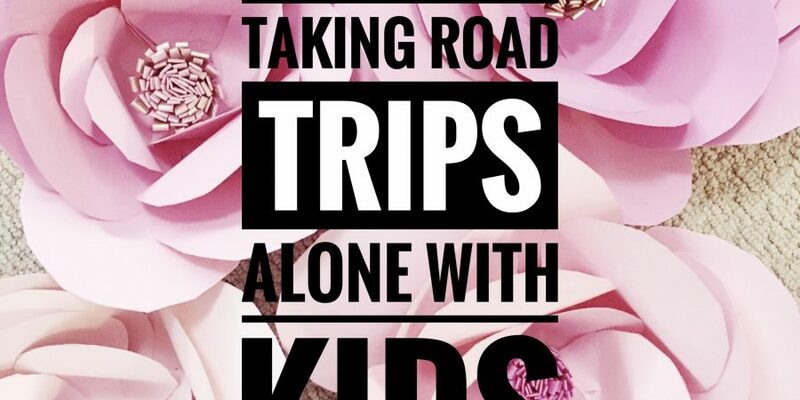 So, I decided to do the unthinkable….take the drive alone with 3 kids! The Hello Kitty party was amazing (check out the details here) but the drive down was a disaster! Being a SAHM, I’ve now done the drive alone with the kids a ton of times in the last year to keep in touch/visit friends and family. I’ve learned a lot and now have it down to a somewhat “science”. Yes, I still deal with fits and meltdowns but I’ve found a way to somewhat limit them or be prepared for them. 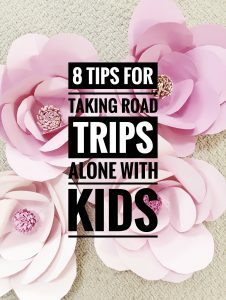 For these 8 tips for road trips with kids it’s important that you plan a head and be mentally ready for the drive. Being positive and in a good mental state lowers the stress of dealing with issues the kids may have on the drive. See how to practice mindfulness here. I watch the news and Forensic Files. I know there are weirdos out there. To make sure everyone knows where we are, I text my family when I’ve left and check in at stops. Also, the kids and I all stay together and hold hands or use the stroller when we are out of the car. I also lock the car and stay aware of my surroundings. I only drive during the daytime with the kids and only stop at very populated bright places. I know what you’re thinking. It’s a lot more cost and time effective to pack snacks. I do packs snacks but found that letting the kids go into a gas station market and pick one thing each, is soooo entertaining to them. It’s the only time they get to walk around and pick any food item they like (I do have veto power). The kids have experienced picking snacks that they totally didn’t like (a life lesson!). The shopping experience is totally worth the $2 each that I spend. Once I get back to the car, I take all 3 snacks and divide them up between them. I’ve found on these drives, if the kids are only allowed to drink water they drink less. Which means less bathroom stops! A baby will still needs milk, but older kids do just fine on water. Driving by myself on long freeway stretches, I knew I needed to have things that the kids could get to on their own. My oldest daughter was a great help on the drive. I have the iPad centered between the kids between the two front seats so that they all can see it. On the iPad, I downloaded their favorite cartoon shows (or even ones that haven’t seen). In their seats I have next to them coloring books/crayon, books, stickers, etch a sketch, etc. In their cupholders they’ve got their water and snacks. At every planned stop, before I start driving, I make sure they have what they need for the next 2 hours. I found that my kids reach their breaking point about every 2 to 2.5 hours. So, I try to plan gas fill ups, bathroom breaks, snack stops and meals around that. Just 10-15 minutes out of the car seems to calm their nerves. To save on time, We’ll stop for food but set them up to eat in the car, so that I can keep driving. I find if the kids sleep in the car some, it makes for a way more peaceful trip. So, most time I’ll get up at 5:30am (packed the car the night before) change pull ups/let my daughter use the restroom and put the kids straight in the car still wearing their pjs. After crying or complaining a bit they’ll usually fall back asleep or be too tired to say or do much after I start driving. There is nothing worse than sitting in bumper to bumper traffic with a car full of kids. This adds unnecessary time to the drive. So, if you can avoid traffic, do it. Which is quite difficult in Southern California! Long drives alone are hard and exhausting. The night before a drive I make sure to get a good night sleep. and that I’m able to have time in meditation or prayer to be mentally ready for the drive. I always make sure I’ve downloaded podcasts and music to listen to and have a cup full of coffee or tea. Make sure you’re awake and entertained. When the kids start having issues in the back, if its critical, I get off the freeway, but most of the time I tell them, “Mommy is driving and I can’t turn around, figure it out and I’ll help you at the next stop”. What other things do you find helpful on long drives with kids? How do you prepare for them?